All Car Electrics are specialists in the diagnostics and repair of electrical and electronic faults on P38 Range Rovers, providing a fully mobile service to the general public and the motor trade. Using the latest tools and diagnostic equipment we have the necessary knowledge and experience to correctly diagnose and rectify most of the faults and failures on your P38 Range Rover. If it is playing up or completely dead we can fix it. 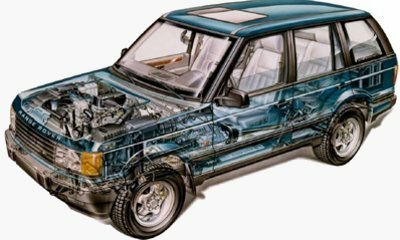 The P38 Range Rover, although designed in the 1990’s, was a very revolutionary design for its time and used a lot of electronics to control the vehicle. The brains of the Vehicle, a unit called the BECM, influences almost everything on it. The BECM controls Central Locking, Alarm, Immobiliser, Lighting, Indicators, and the power supply to virtually all other electrical equipment. A fault on the BECM can cause complex problems that need correct diagnosis and repair. It's very easy for a fault on the BECM to be incorrectly diagnosed as a fault elsewhere on the vehicle. Regularly door locks are replaced because the central locking has stopped working when in fact the BECM has isolated the central locking because of another fault. We provide technical advice to the Motor trade and the general public, travelling in the past to France, Germany, Switzerland and even as far away as Cyprus to diagnose and repair faulty P38 Range Rovers. We also regularly have customers post failed BECMs and ECUs to us for test and repair. We are well known internationally and have received items from as far afield as the USA, Canada, Australia and one time from the Falkland Islands. You get your vehicle to us to test and repair and you then collect the vehicle. Many P38s arrive on AA or RAC recovery vehicles and are driven away by the customer. Example...a recent P38 was recovered from Southern France on a recovery truck by an insurance company. The Vehicle had alarmed itself and would not start. It arrived at our workshop and we had it reset and running before the recovery truck had left the yard. We come to you test and repair your vehicle where possible. In this case we need to ascertain as much information about the problem as possible before we attend. We charge a travelling charge for this service which is calculated on a mileage basis. Please phone for details. For jobs out of the Country, to Europe and further afield we would liaise with you the customer regarding travelling costs to get the best price we could. Example...we had a call from a British guy living in Spain whose P38 had stopped working. His car had been towed to three different 'experts' in Spain who could not get it running, could we help? I suggested sending us the BECM but he asked if we could attend so the next day saw a member of staff on a cheap flight from Gatwick to Barcelona, man and gear was collected from the airport in a borrowed car and three hours later driven back in the customer's P38. As many of the problems are associated purely with the BECM, it is often possible just to post it to us for us for repair and return. We normally use Post Office Special Delivery at a cost of £26 each way including £500 insurance and Guaranteed Next Day delivery. Normally we can test and complete the repair within 24 Hours. Example...a recent customer's BECM failed in Scotland on a Sunday, the failed BECM arrived with us on the Tuesday, was repaired and back in the post Tuesday afternoon and the customer was able to drive his P38 to work on Thursday morning.